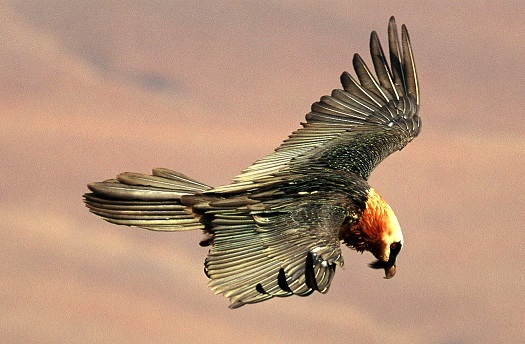 (January 28, 2015, The Condor: Ornithological Applications)—A new open-access study published this week in The Condor: Ornithological Applications finds that the leading cause of territory abandonment by Bearded Vultures (Gypaetus barbatus) in southern Africa is human activity, rather than food shortages or climate change. Sonja Krüger, Robert Simmons, and Arjun Amar of the Percy FitzPatrick Institute of African Ornithology created a statistical model to evaluate to what degree each of these three factors contributed to nesting territory abandonment in Lesotho and South Africa over a period of five decades. They found the greatest support for the human activity hypothesis, with the most important variables being the density of power lines and human settlements within a territory. Based on their results, the researchers suggest restricting the construction of new power lines and settlements within 10 kilometers of occupied Bearded Vulture territories, taking measures to mitigate the effects of existing power lines, and increasing law enforcement and education in areas where humans and vultures come into conflict. Read the full open-access paper at http://www.aoucospubs.org/doi/full/10.1650/CONDOR-14-121.1.